One of the star lots is a 1963 Jaguar E-Type that has was found under a hedge in the village of Bisley in Surrey that was once owned by Ivor Arbiter, famous for designing the famous sixties music scene ‘drop – T’ logo for The Beatles. Coys valuer James Good said about the car: “This wonderful Series 1, 3.8 E-Type is in original condition, with matching numbers and has never been restored. It retains all the features it carried in 1969 and is possibly one of the most original examples remaining today”. Other important lots include a 1979 Maserati Khamsin (£95,000 to £105,000), a 1901 Delin 4HP Voiturette (VCC Dated 1901, London-to-Brighton Run eligible -£58,000 to £70,000) and a 1926 Rolls-Royce 20 HP Open Tourer By Thrupp & Maberly (£55,000 to £65,000). Collectors on the lookout for the next multimillion-pound Ferrari will find a number of sought-after examples from the Mackley-North Collection. 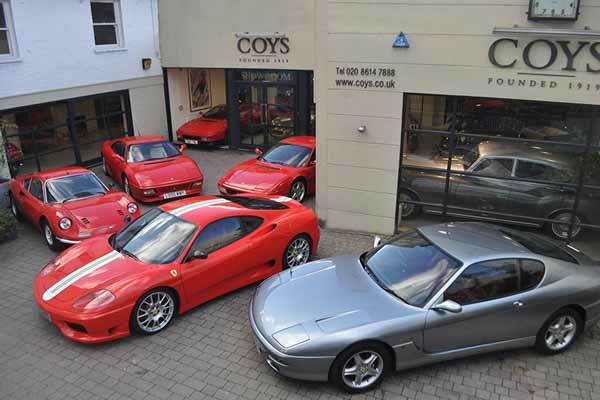 The range of Ferraris in include a 1988 Ferrari Testarossa Coupe (£75,000 to £90,000), a 1992 Ferrari 512TR, 8,000 KM from new (£150,000 to £170,000), a 1971 Ferrari Dino 246GT Coupé Coachwork by Scaglietti and design by Pininfarina (£220,000 to £240,000), a 1997 Ferrari 456 GTA, 27,000 miles from new (£48,000 to £58,000), a 1994 Ferrari 348 TB Speciale that is one of only four cars delivered to the UK (£50,000 to £60,000) and a 2003 Ferrari 360 Challenge Stradale (£160,000 to £180,000). COYS Spring Classics auction takes place at the Royal Horticultural Society, Lindley Hall, Vincent Square, Westminster, London on March 8th at 7pm. Viewing of lots is available on Monday 7th March between 12.00 noon and 8.00pm and on March 8th from 10.00am to the start of sale. For more information on both auctions and full catalogues, please visit The organiser website.